This Sevilla guitar maker had a close relationship with Antonio de Torres, whose workshop was a few doors from his on the Calle Cerrageria. According to a story that Jose Ramirez III claimed was handed down in his family if Torres made a guitar that didn't meet his expectations, he would sell it to Manuel who would sell it under his label (Romanillos and Winspear 1995: 189). While I don't doubt that Torres made guitars for Manuel de Soto y Solares, I think this story is probably a romantic interpretation of common transactions between makers. Makers constantly buy or trade with one another, and it is common for established shops that have more orders than they can fulfill to subcontract or buy guitars from other makers, and sell them under their own label. In the 1860s, Manuel de Soto and Solares was an well-established maker in Sevilla. His father and both grandfathers were all luthiers. In the mid-1860s, Torres was not able to make a living by just building high-end guitars, so had to make cheap “bread and butter” guitars, just like “nearly every other maker in the ninetieth century" (ibid 190). It is very likely that he made such guitars for Manuel to sell. In 1865, as Romanillos and Winspeare document,Torres gave up his shop at 32 Calle Cerrageria, and went to live with his common-law wife. It is quite likely he needed to build “bread and butter” guitars more than ever during these couple of years that he was without a workshop. He may have built out of his house, but there are no guitars with this address or he could have used the workshop of Manuel Gutierrez or that Manuel de Soto y Solares whose shop was across the road, and sold them through Soto y Solares. * The intriguing possibility is that there maybe a good number of Antonio de Torres built during his years in Sevilla that may bear a Manuel de Soto y Solares’ label. Clearly the two men knew each other well, and Manuel’s work was influenced heavily by Torres. Manuel de Soto y Solares seems to have enthusiastically adopted Torres style of construction, and so drew important clients such as Juan Breva (1844-1918) who is known to have used a Manuel de Soto y Solares guitar made between 1870 and 1890. This guitar presently on exhibit at the Museo Flamenco de la Peña, Juan Breva. What is evident in the fifteen or so guitars know of Manuel de Soto y Solares is that he was a highly skilled artisan. Perhaps this is why his guitars have survived and remain prized, where guitars by his contemporaries in Sevilla are very scarce. 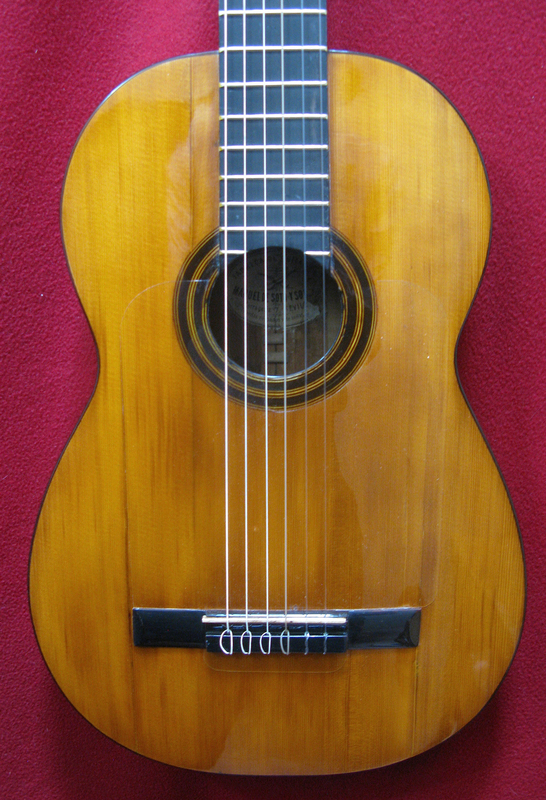 While this guitar is not dated, it is a Torres style guitar with his headstock and rosette. Its proportions seem to follow that of FE 20 made in 1864. It has five fan braces, and 650 mm scale. What makes this particular guitar interesting besides Manuel de Soto y Solares close association with Antonio de Torres is that we know this guitar's history. The guitar originally belonged to Jose Bona Fernandez who lived on the calle Socorro near the plaza de San Roman. He had three siblings, Rafaela, Maria, and Antonio. When he died, his younger brother, Antonio Bona Fernandez, inherited the guitar. In 1972, Antonio age 48, died and it passed to his nephew, Miguel Mata Pinilla. According to Miguel, his uncle Pepe Bona Fernandez was a member of the Trio ABC, which stood for Abuelo, Bona, and Carlos. Pepe Bona Fernandez played guitar, another Bandurria, and other laud. They were a popular musical group in Sevilla that played pieces such as “El sitio de Zaragosa, El bolero de Ravel. The Trio was good enough to have performed for King Alfonso XIII. This was probably in 1929 when Alfonso XIII came to Sevilla to open an exhibition. With this information, I was able to trace the Trio ABC activities from the 1930 to 1950 in a local newspaper from Sevilla, that oddly enough is called ABC. They are first mentioned July 1, 1930 as one of the groups playing at the opening of the Casino “Agrupacion Cultural Recreativa” in the Barrio de Aguila, where they and the Egea Orchestra played music all night. Six weeks later, they performed at the “fin de fiestas” during the semana Andaluza along with the great flamenco cantor, Manuel Centano (B. Sevilla 1885-1961). In 1937, we find them on a flamenco program titled “Luces de Espana” playing before a distinguished audience of consular representatives from Germany, Italy, and Portugal with among other the flamenco dancer Carmelita Cruz, guitarists Antonio Hernandez (1889-1962? ), and Antonio Moreno (1890-1937), other performers included el Nino de Fregenal (1911-1982), Antonio Salas, the Hermanos Al Keus, and Melena (1872-1956). In 1942, they were playing regularly at the Venta La Alegria a night club on Carretera Carmona, appearing with the flamenco troupe Andaluz. The following year they were one of house acts, at the the Gran Casino Terraza, again with the Andaluz flamenco troupe, and the Mundial Jazz Orchestra. During the year they appeared with guest stars such as the Hermanos Dorados, Hermanas Dreyer, and Josefina Garcia. In 1944, the Trio ABC was still playing at the Terraza Gran Casino performing with the Conchita Verdu, Rosita Hernandez flamenco group that included Manolita Gutier, Conchita Verdu, Nati Guitier, and with the orchestra Mundial Jazz. Guest performers included the singers, Isabilita Fernandez and Olgra Viana. During 1949 and 1950, the Trio ABC were a regular act at the Andulcia de Noche (Bar Citrone) that presented typical Andulcian fiestas appearing with the La Gitanilla Remedio flamenco troupe, appearing with the Trio de Oro.